Are you looking for ways to make math skills practice more engaging and fun? KleenSlate’s Student Whiteboards not only make practice fun for students, using them provides instant feedback for both students and teachers. This quick response method allows the teacher to know when to re-teach or offer remedial assistance. Here are some guidelines and suggestions for teachers who want to use KleenSlate Whiteboards to practice math skills and concepts. Give each student a KleenSlate Whiteboards with an attached marker and eraser. Ask students to perform a specific math task on the Whiteboard. Have all students hold up their boards to display responses. Write and show the correct response on your board. Instruct students to keep a record of the accuracy of their responses. The teacher also records which students are responding correctly. He/She can use this information to plan remedial instruction for specific students. If a large number of students fail to respond accurately, the teacher may decide to re-teach the concept. Drawing a specific geometric shape. For younger students ask them to draw basic shapes, i.e. rectangle, circle, and triangle. For older students, ask for more difficult shapes (pyramid, cube, pentagon, hexagon, cone, triangle-isosceles, equilateral, and scalene). Have students draw a clock face on their boards and practice writing times dictated by the teacher. Write numbers counting by 1’s, 2’s, 5’s, 10’s, etc. as quickly as possible within a certain time limit. Ask students to write “number sentences” to express a given number. For example: the number 12 can be represented by: 3×4=12 14-2=12, 6+6=12. For an extra challenge: ask students to write a specific number of sentences within a given time limit. Ask students to reduce fractions or write factors or multiples of a number. Partner students. Have one student write two numbers on a Whiteboard and then pass the paddle to the partner who determines the correct symbol to go between the numbers, i.e. >, <, or =. Have each student write a math calculation problem and then exchange Paddles. The partners solve each other’s problems, and then return the Whiteboard to the problem writer who checks the accuracy of the answer. Have students categorize numerically. For example, ask students to write the day and month of their birthdays on the Whiteboard. Then have them line up silently in chronological order according to birthdays, using the information on the boards. This activity can also be performed using other numbers such as their numerical address, phone numbers, or combined age of siblings. 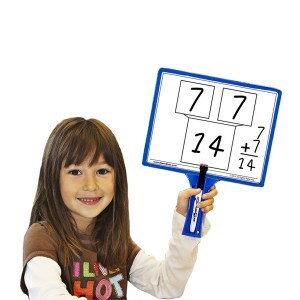 Please let us know how you are using KleenSlate Whiteboards to practice math skills in the comment section below. We love your feedback!